At 19% of our full-year estimate, WASEONG’s 1Q18 earnings is deemed in line as we expect earnings to pick up in the next few quarters with higher project recognition and lower tax rates. 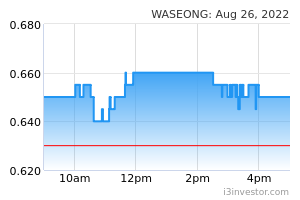 Meanwhile, WASEONG’s tender book is up 16% QoQ with higher international bids, paving for replenishments post NS2. With no changes to our estimates, we maintain our OP call on the stock with unchanged TP of RM1.80 pegged to 12.0x FY18E PER. Deemed within expectations. Despite only accounting 19% of our/consensus full-year estimates, 1Q18 core net profit (CNP) of RM21.2m is deemed within expectations as we expect earnings to pick up in the next few quarters due to normalisation of effective tax rates. No dividend was declared, as expected. 1Q18 CNP down sequentially due to higher tax expenses. CNP decreased by 46% QoQ to RM21.2m from RM39.1m in 4Q17 after stripping off gain on disposals amounting to RM8m, net forex gain of RM0.5m and other items. 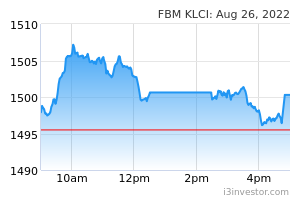 The weaker performance was dragged by: (i) weaker O&G segment (-8%; lower project recognition), (ii) tax expense of RM11.9m vs. 4Q17 tax credit of RM12.3m, and (iii) lower contribution from renewable energy (RE) segment (-68%; led by lower steam boilers sales and margin compression). This was cushioned by better industrial trading and services (ITS) segment, which recorded RM6.2m EBIT this quarter, improving from a marginal breakeven level of RM0.4m profit in 4Q17 due to better product mix. 1Q18 CNP up 2.4x YoY. 1Q18 earnings improved by 2.4x YoY from RM6.2m in 1Q17 backed by 1.5x surge in revenue led by turnaround of both O&G and ITS segments overwhelming weaker RE segment (-39%; margin compression). Tender book increased by 16% QoQ to RM5.8m. Despite order-book being reduced by 11% QoQ to RM2.5b due to recognition of the NS2 project which is currently at 40% completion, we understand that its tender book grew by 16% QoQ to RM5.8b due to increased O&G project bids from Europe and Africa. Meanwhile, following the change of federal government post GE14, we believe some of the local projects such as MPP and TSGP might be reviewed again before the actual contract awards. However, WASEONG still stands a good chance to win the projects as the company is the only API certified local pipe manufacturer. Retain OUTPERFORM with unchanged TP. We maintain our FY18- 19E estimates as we expect earnings to pick up in the next few quarters with higher billing from other new projects coupled with normalisation of effective tax rate. Thus, we maintain OP call on the stock with an unchanged TP of RM1.80 pegged to 12.0x FY18E PER. Risks to our call include: (i) weaker project execution, (ii) smaller-than- expected contract size, and (iii) lower-than-expected margins.